Let your personality shine with these rip jeans. 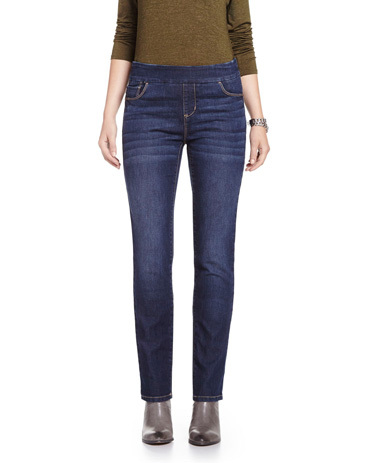 Featuring pockets at the front and the back, these skinny jeans are basically your next go-to! Pair them with a shirt and flats for a trendy and laid-back look. Front rise: 8 3/4" ; inseam: 31" ; leg opening: 5 1/2"
TIP: Wash jeans inside out, in cold water to minimize fading and prevent dye from bleeding. I ordered these jeans online and when I tried them on was surprised and disappointed because they were actually quite baggy....not what I was expecting from a "skinny" jean. I actually even noticed that the sticker/label on the clear packaging of the jeans read "loose". Kinda confusing? I am a plus size woman. I used to do almost all of my shopping at Reitmans but with the sizing switch up I have been very limited to what I can buy in stores as well as online. Very comfortable, doesn't loosen too much when wearing! I really like the feel of these jeans! These jeans are probably the most comfortable pair of jeans I have ever worn. These faded so much after the first wash - they are much more of a medium rinse than a dark one. Very disappointed.